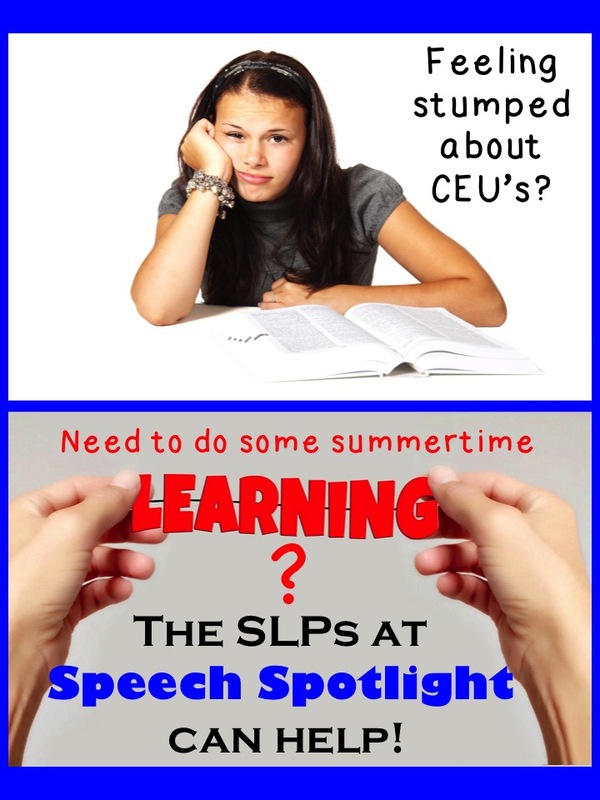 The Speech Spotlight SLPs Can Help! If you are like us, you may have off in the summer, or cut back your hours, but you rarely stop working completely. Summer is a time to refresh and rejuvenate, but it is also the time when many SLPs get their CEU’s or read about about an area in which we want to gain more expertise. The Speech Spotlight bloggers are here to help you out! Susan is our resident AAC expert, having many years of experience as a private SLP providing AAC evaluations, therapy and support services in California. She recommended that you visit her favorite blog, http://praacticalaac.org, to find a wealth of information! I’d like to say the same about her blog, http://kidzlearnlanguage.blogspot.com . For CEUs, you can find several topics for AAC (including one that Susan wrote) offered online at https://pdhtherapy.com . This can be a hard area to find specific classes for, so thanks for sharing it, Susan! I (Linda) had worked with students on the higher end of the spectrum while I was in preschool for many years, but then I took a job at a special school for students with severe communication and behavioral needs, most of whom had autism. I started taking courses (like crazy- I earned 2 ASHA ACE awards in one cycle!) and reading independently to make sure my skills were as solid as I could make them. A few experts really shaped my practices. For using visual supports, I learned a lot from Linda Burkhardt and you can get her handouts at http://lburkhart.com/handouts.htm . I would recommend taking courses from Barry Prizant (SCERTS.) You can get free downloads at http://barryprizant.com/resources/downloads/ . Tamatha also works with students on the spectrum, especially preschoolers, incorporating an ABA approach in her therapy with the focus of building functional communication skills. She is lucky enough to get free training from her district, but reminds us not to miss out on the free CEUs that ASHA has been offering. Sarah is our resident bilingual Spanish therapist, who also has won awards and fame for her blogging. She recommended http://bilinguistics.com/ if you need CEUs. There are also free downloads in a variety of areas at this site. Lisette is on a mission to gain expertise in this area! If you work with preschoolers, you know that this is an area we need to be knowledgeable about. Lisette was lucky enough to be able to take a class with Dr. Edythe Strand, a national expert, and got her permission to share the information! You can find it on her blog: http://www.speechsproutstherapy.com/2016/04/childhood-apraxia-of-speech-what-slps.html . If you’d like more information, I have found http://www.apraxia-kids.org/learn-about-apraxia/library/ to be a great free resource link. Ashley B. is our resident fluency specialist. If you need tips in this area, you might want to check out the fluency series she has started on her blog: http://sweetspeech.org/2016/01/stuttering-101.html . When she needs more resources, one of her go-to places is the National Stuttering Foundation at http://www.stutteringhelp.org/ . The other resource, https://www.stutteringtherapyresources.com/resources , has free videos and downloads! Collette has worked with preschoolers who have intensive communication needs for a while now. She recommends that you check out the Hanen Center at http://www.hanen.org/Professional-Development/Workshops-For-SLPs.aspx for CEUs and helpful hints. Ashley R. is another SLP in our group who does private practice. She recommends reading books as a way to get a deeper understanding of your students and their problems. She found the book The Whole-Brain Child, by Daniel Siegel, to be helpful in dealing with the emotional needs of her therapy children. Another of her favorites is Raising Your Children Who Think For Themselves, by Elisa Medhus. While this book is geared toward parents, she has found it to be very useful in therapy as well. Jennifer really loves the variety of activities that can be used when doing articulation therapy, finding inspiration from Pinterest and reading blogs. One blog that she recommends because of its great free downloads and information is http://mommyspeechtherapy.com/. Does this leave you wanting more?